SEOUL (Reuters) - Tucked between trees and paddy fields in a quiet suburb in the west of Pyongyang, Chilgol Church is one of four state-operated churches in the capital of a country that espouses freedom of religion but effectively bans it. In recent months, the Protestant church has been renovated - its rusted iron roof replaced with new tiles, and its faded brown brick walls repainted yellow, according to a North Korean propaganda video. At the same time, North Korea has sentenced two foreign missionaries to hard labor and along the border with China, both countries have cracked down on religious groups. 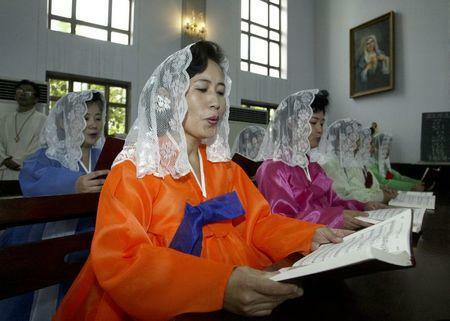 As Pope Francis visits South Korea this week in his first trip to Asia, religion in North Korea is under the spotlight. People who regularly travel to the North Korean capital describe its churches as showpieces for foreign residents and tourists. Many foreigners are invited to sit in front-row pews, they say, but are prohibited from mingling with a congregation hand-picked by the state. North Korea's constitution guarantees freedom of religion provided it does not undermine the state, but outside of a small handful of state-controlled places of worship, no open religious activity is allowed. "To be a Christian in North Korea is extremely dangerous, and many Christians who are discovered end up in the prison camps or, in some cases, executed," said Benedict Rogers of Christian Solidarity Worldwide, which campaigns for religious freedom. "The regime demands absolute loyalty and devotion and sees religion as undermining this," he said. North Korea turned down an invitation from the South Korean Catholic church for members of its state-run Korean Catholic Association to attend a papal mass next week in Seoul, citing the start of joint U.S.-South Korean military drills, due to begin on the same day. A United Nations report earlier this year cited estimates that between 200,000 and 400,000 of North Korea's 24 million people are Christians. The number is impossible to verify because most Christians cannot worship openly. An overwhelming 99.7 percent of defectors from North Korea said in a survey late last year that there was no religious freedom in the country. 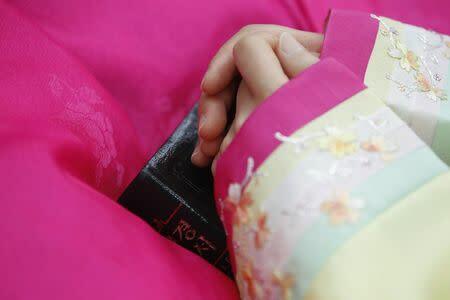 Only 4.2 percent said they had seen a Bible when they lived there, said the survey of over eight thousand defectors by the South Korea-based Database Centre for North Korean Human Rights. In May, the isolated country detained U.S. tourist Jeffrey Fowle for leaving a Bible in the toilet of a site visited by his tour group, and U.S. missionary Kenneth Bae is serving a 15 year hard labor sentence on charges of attempting to bring down the government. 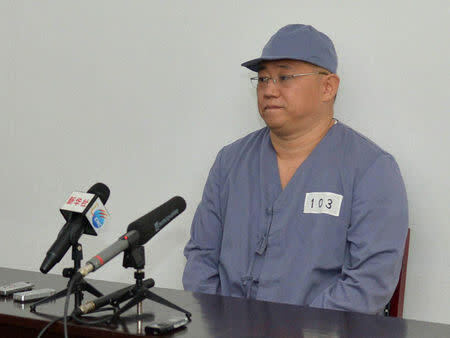 Another missionary, South Korean Kim Jeong-wook, was sentenced to life with hard labor in June after a North Korean court found him guilty of espionage and setting up an underground church. Religion was once considered part of the North's unification policy, with the strategy of trying to align with religious leaders in the South who were battling the country's military rulers at the time. But the success of South Korean religious groups in helping to oust its own military dictatorship may have caused Pyongyang to treat its official relationship with religion more carefully. "Part of North Korea's fear of Christianity stems from the successful challenge which Christians like Kim Dae-jung and Cardinal Stephen Kim made in ending the military dictatorship in South Korea," said Lord David Alton, chairman of the United Kingdom's All-Party Parliamentary Group on North Korea. As head of the Korean Catholic Church, Cardinal Kim helped mobilize South Koreans against South Korea's military dictatorship in the 1980s, alongside former President and democracy activist Kim Dae-jung, a fellow Roman Catholic. "With the imminent arrival of Pope Francis in Seoul, they (Pyongyang) will also be reflecting on the role which John Paul II played in ending Eastern European communism," Alton said. However, North Korea's founding president Kim Il Sung was the grandson of a Protestant priest and his mother, Kang Ban Sok, was a devout Christian whose first name came from an early Korean translation of the biblical name Peter. The Chilgol Church was built in her honor, but sits 300 meters (yards) from a propaganda museum and statues dedicated to her as the revolutionary mother of the man who became father to the state. As at any church, a softly-spoken vicar may shake hands and chat with visitors as they leave, but officials carefully scrutinize the church after services and count Bibles to make sure none have gone missing, regular visitors say. In the 1980s, the North, under pressure to change with the deepening of economic problems and main ally China's growing openness, began looking to foreign religious groups as a means to forge links with the outside world. The government gave official status to religious groups and allowed the publication of the Bible, and in 1988 the main churches for the Catholic and Protestant faiths, Jangchung and Pongsu, were built in Pyongyang. The Chilgol Church and a Russian Orthodox church were set up later. But there is no genuine religious freedom in North Korea, the U.S. State Department said in a report late last month. State media dismissed the report as an attempt by the United States to "tarnish its image". But fealty to the Kim family that has ruled North Korea for over half a century is paramount. "They have attempted to replace religion with a cultish dynastic ideology," said Alton. "But by outlawing religious freedom they have denied their society an engine for social and economic change."